January is National Book Month, and here at Lourdes we can’t get enough of our favorite stories. Books are a wonderful pass time with many great benefits. They offer opportunities for adventure, taking us to epic lands both real and imagined. They teach us hard lessons about life, love and friendship. Books strengthen our capacity for empathy and connect us to others. There are many health benefits as well. Reading improves analytical thinking and concentration. There is also a correlation between reading and reduced stress. Relaxing with a good book has been shown to reduce heart rate and muscle tension, alleviate depression and anxiety, and reduce the risk of Dementia and Alzheimer’s disease. Whatever the reason for reading, there’s nothing quite like the excitement of picking up a new book. Except maybe sharing your experience with others. Monsignor Ricardo Bass is a resident at Fox Manor. He is also the leader of their book club. The book club changes books every other month. In November they began reading The Shack by William P. Young. The Shack is a work of fiction that focuses on the question “where is God?” in a world full of pain. In January the book club began another work of fiction titled Wise Blood by Flannery O’Connor. This novel explores topics of faith, redemption and wisdom. Monsignor Bass chooses the books the club will read, but the group gives their input to the selection process. Other titles they plan to discuss include Time for God by Jacques Philippe, Night by Elie Wiesel and Diary of a Country Priest by Georges Bernanos. “I am blessed to be in a community with so many well- read and intellectually- astute individuals,” said Msgr. Bass. If you missed out on National Book Month, don’t let that discourage you from picking up a great new read today. Below are a list of recommendations from our residents and staff, including the books read by Fox Manor’s book club. Enjoy! 1. Find a Partner: it’s always a good idea to have a friend to exercise with. Having a partner makes the sometimes-dreaded-task of exercise more pleasurable. It will also encourage you to go even when you don’t feel like it. 2. Change-It-Up: motivation to exercise is easier to find when the activity is new and exciting. Find new movements to incorporate into your routine or a new class to take. Change your scenery. Walking an indoor mall or arena, instead of the treadmill at the gym every day, may help keep you motivated. 3. Give Yourself Incentive: reward yourself with a favorite treat. This does not have to be a sweet. A treat could be a new book, a trip to the movies, or a healthy lunch at your favorite restaurant. Adding incentive will help you meet and maintain health goals. The holidays are fast approaching and as they near our calendars fill with festive activities, family gatherings and opportunities for delicious seasonal treats. In addition to roasted turkey or honey glazed ham, our appetites are tempted with pumpkin pie, Christmas cookies and assorted chocolates, not to mention rich side dishes loaded with savory carbs. The food options are endless, and while delectable, much of our holiday favorites are loaded with sugar. According to the University of California San Francisco, sugar consumption based on an average 2000 calorie diet should not exceed 25 grams for women and 38 grams for men. For most, the recommendation is surpassed not once but twice over. The standard American consumes 82 grams of sugar daily. During the holidays, this number can sky-rocket. A study conducted by Associated British Foods noted that the average person eats over 7000 calories Christmas day. While this may seem like a lot, it isn’t difficult to do. Many of us visit multiple family and friends Christmas day, eating dinner at each or perhaps just an extra dessert. There are 215 calories and 20 grams of sugar in a 4 oz slice of honey glazed ham. The size of this serving is equivalent to a deck of cards which isn’t enough for most of us. Throw in some cheesy potatoes, stuffing and a roll on the side and a Christmas dinner can add up to over 1000 calories and 100 grams of sugar in one meal. The effects of sugar one day a year won’t necessarily place you at an immediate health risk. However, overindulgence overtime can lead to diabetes, high blood pressure and heart disease. At the very least, overconsumption of sugar may cause weight gain. Elevated levels of insulin in the blood cause the body to store more calories as fat. Likewise, insulin effects leptin, a hormone that works as an appetite suppressant, helping us know when we have had enough. So how can you ensure a healthy holiday season while still enjoying the festivities? Here are four suggestions from our staff for those who are health conscious. Eat smaller portions. Treating yourself isn’t horrible. In fact, avoiding sweets all together may backfire. By withholding temptation, you may find yourself overcompensating later. Let yourself partake in holiday cheer. Don’t overfill your plate and take a smaller piece of pie. Keep snacks out of sight and out of mind. If you have snacks stashed for the big day, put them up. Don’t open the bag. Keeping them closed up reduces the temptation to grab a few chocolates or a cookie beforehand. Eat throughout the day. Eating small meals consistently will regulate your blood sugar, reducing cravings for something sweet. Don’t center your gathering around food. Plan other activities such as games or caroling. We hope each of you enjoys the coming holiday season, having a very Happy Thanksgiving and a Merry Christmas! I Scream You Scream! - July is National Ice Cream Month! Rocky Road, Butter Pecan, and Mint Chocolate Chip! Summer was made for ice cream and we all have our favorite flavors. The frozen treat is a summer time staple with classic flavors we love. But, if the classic flavors aren't enough to make you want more, ice cream companies know how to thrill your taste buds, developing new and unique combinations like Blondie Ambition (brown sugar ice cream, blonde brownies and butterscotch toffee flakes) and New York Super Fudge Chunk (chocolate ice cream, white and dark chocolate chunks, walnuts and fudge covered almonds). There’s a flavor for everyone, all of which are a great escape from the summer heat! But do we really need an excuse to eat ice cream? America’s love for this dessert is endless, generating around $3.5 Billion annually in sales. Perhaps that is why President Reagan declared July as National Ice Cream Month in 1984, and July 15th National Ice Cream Day. How can you say no to that celebration? Lourdes certainly didn’t! Throughout July, residents observed this special month with ice cream bars, cream sickles and milkshakes. 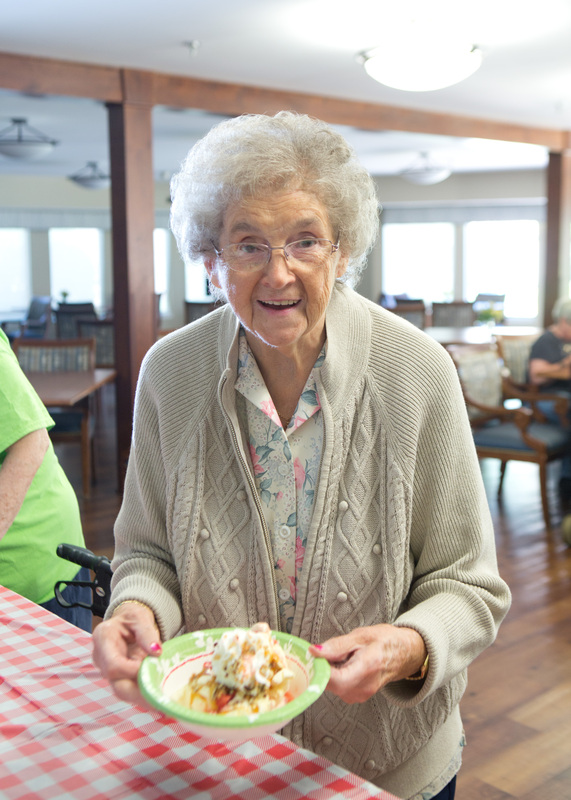 Mendelson Assisted Living and Clausen Manor also both hosted ice cream socials, providing sundaes with an assortment of delicious toppings. And July isn’t over yet! There’s still time for you to celebrate with your favorite frozen treat! Joint replacement – taking simple steps after surgery can help you Restore, Re-strengthen and Return home quickly. According to the American Academy of Orthopedic Surgeons, over 500,000 Americans have a knee replacement each year. Hip replacement is also common, with around 300,000 performed annually. That number has been on the rise over the last decade, and those receiving the surgery are choosing to do so at a younger age. As medical advances continue to progress, more people chose joint replacement as a solution to arthritis, avascular necrosis or old injuries. 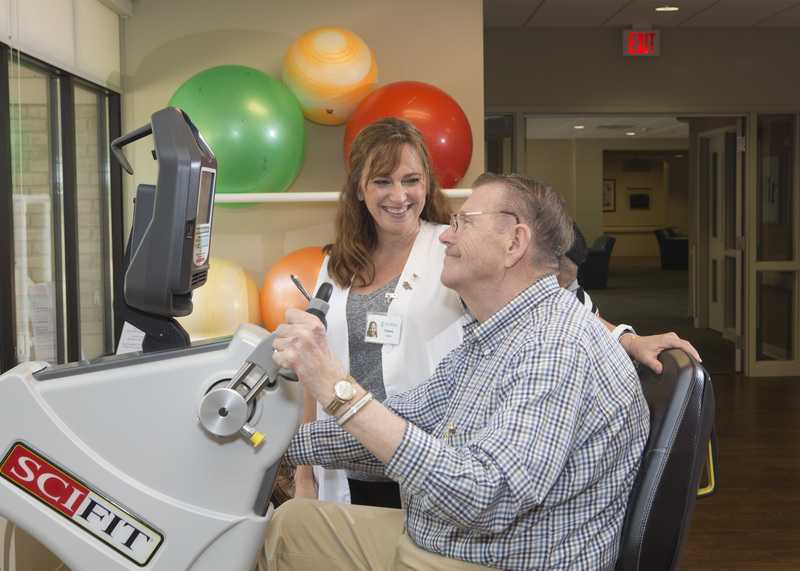 Recovery and rehabilitation after surgery is different for each person. In general, your doctor will encourage you to use your “new” joint shortly after your operation. Usually, patients will be asked to start walking the same day after hip or knee surgery. At Lourdes Rehabilitation and Healthcare Center, we follow these four steps to help you Restore, Re-strengthen, and Return home. Activity: with the help of physical and occupational therapists, activity helps joints to regain their function and decrease pain. Pain Control: pain that is not managed appropriately could lead to decreased activity and increased stiffness, slowing recovery and limiting function. Ice and proper medication will help you re-strengthen and restore joint capabilities. Fall Prevention: with a new joint, there is an increased risk for falls because of pain and decreased mobility. Assistive devices such as a walker or cane, combined with a home evaluation by a therapist reduces fall potential. Monitor for Complications: be aware and watch for early signs of stiffness, infections, blood clots and embolism to prevent recovery delays. As the face of long term care changes so do the expectations of the residents and their families. This includes the model of care practiced by the team. Join us for a brief introduction to person-centered care, the model of care Lourdes Senior Community has adopted. While important for all residents this is especially poignant when caring for those with memory loss. 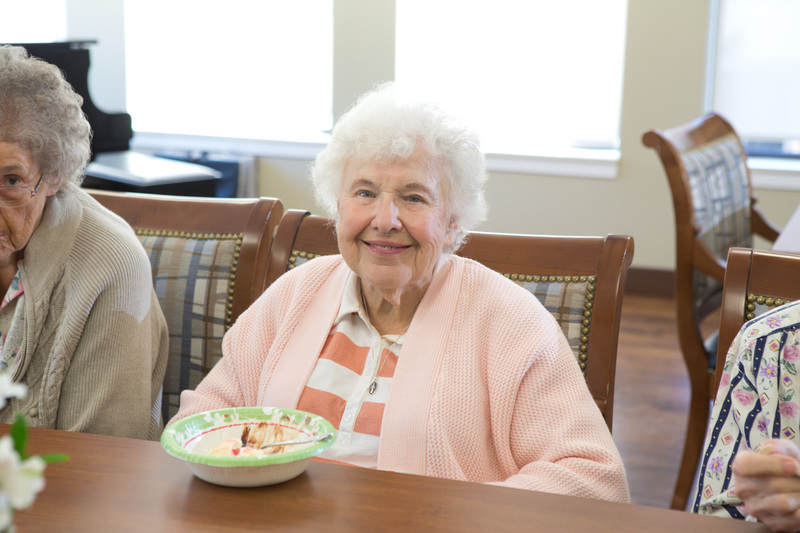 There are many activities enriching the lives of our seniors. This issue features activities that promote communication and outreach. You will find stories about Fox Manor’s recent charity work, pet therapy visits around Lourdes Senior Community, sign language classes at Lourdes Rehabilitation and Healthcare Center, and the observance of Compliment Day at Clausen Manor. Lourdes is a holy place, sustained by your prayers and support. Your commitment to our mission supports Lourdes as we strive to be the best senior living experience anywhere. Please know of my gratitude. May God continue to grace you for your kindness. Enjoy playing cards? 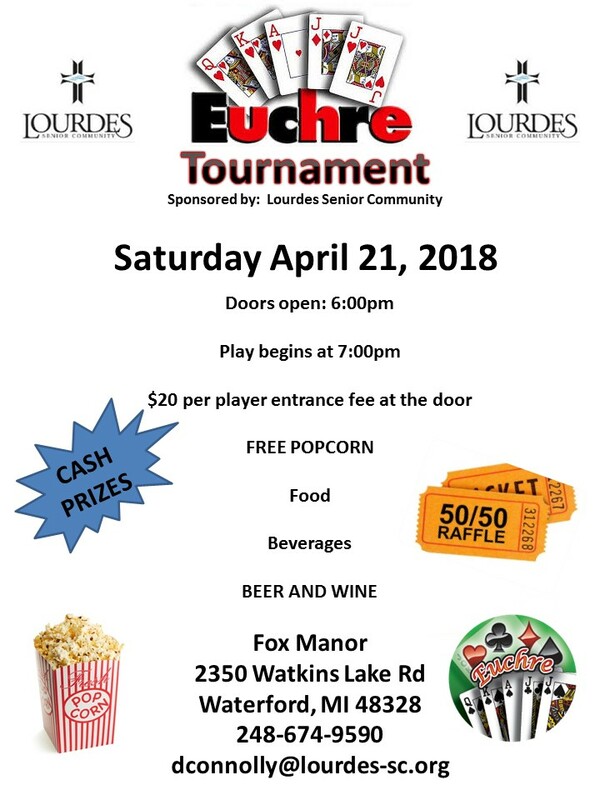 Fox Manor is hosting a Euchre Tournament! Enjoy an evening of Euchre with family and friends while supporting a worthy cause. All proceeds will go to support Fox Manor residents! Plans are already under way for the 17th Annual Golf for Lourdes Event, and we hope you join us at the prestigious Indianwood Golf and Country Club on June 12, 2018. Surrounded by beautiful architecture and landscape, you’re sure to forget your worries as you play the challenging “New” course, and enjoy the camaradie of new and old friends, all while supporting a worthy cause. The theme this year is Las Vegas! In addition to golf, join the many great opportunities for games, raffles and prizes. Also included with your registration is a continental breakfast, lunch on the course, a delicious dinner and themed dessert served at Indianwood’s worldclass clubhouse. 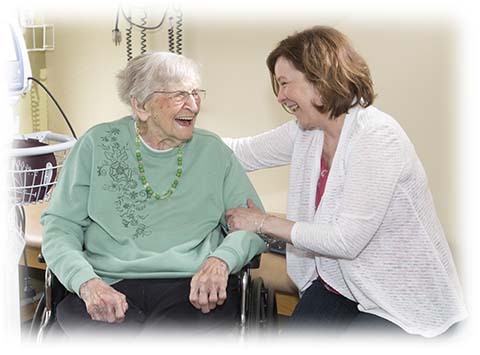 More than $60,000 was raised last year, helping us continue our legacy as a leader in quality senior care. We hope to meet that goal again this year. All funds will directly support the many life-enriching projects taking place at Lourdes Senior Community. In the past these projects have included programs such as massage, music and art therapy, as well as funds for a new resident bus, Alzheimer's education, and construction of the new rehab unit at Lourdes Rehabilitation and Healthcare Center. This is an exciting time at Lourdes Senior Community as we continue to fulfill our vision to ensure our Legacy for Future Generations. 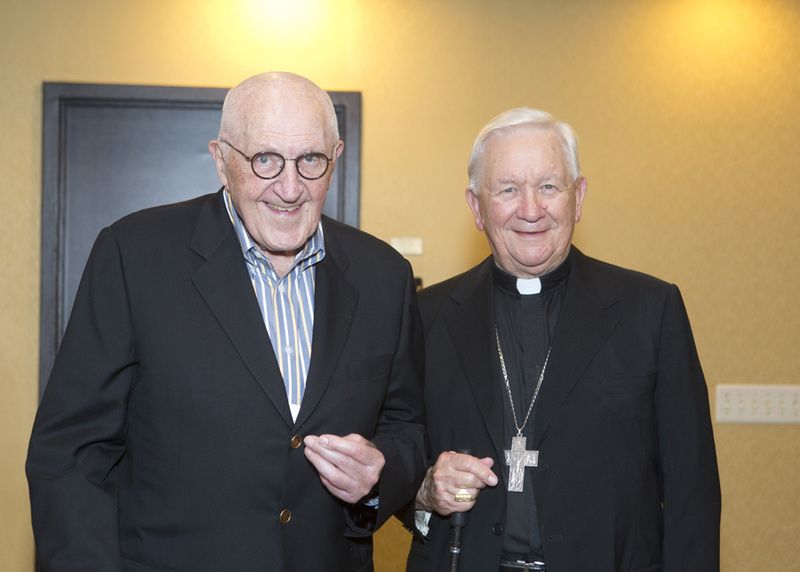 In September we celebrated Lourdes' 4th Annual Legacy Event where we honored Adam Cardinal Maida, Archbishop Emeritus of Detroit and Mrs. Nancy Vlasic. Both of these individuals have donated their time, talent and treasures to improve the life of residents at Lourdes. We are grateful for their dedication. There are always plenty of activities happening at Lourdes, no matter the season. Make sure to read about festivities happening throughout the community on page three. Please note that Mendelson Home (assisted living) celebrated National Assisted Living week including activities to coordinate with the theme "Family is Forever." Lourdes is a holy place that experiences God's blessing every day. Your prayers and support are signs of God's goodness. May you continue to know that goodness every day. Lourdes Legacy Event will take place Saturday, September 23rd this year, at the Detroit Marriott located in Troy, Michigan. Mass will be held at 5:00 pm, followed by a wonderfully prepared dinner and program. We are pleased to be honoring Adam Cardinal Maida, Archbishop Emeritus of the Archdiocese of Detroit and presenting him with the St. Dominic Leadership Award. Cardinal Maida's leadership embraces and promotes the mission of Lourdes. Through his vision and support, Lourdes now serves seniors and their families at Clausen Manor and Mendelson Assisted Living. We will also be honoring Nancy Vlasic with the St. Bernadette Spiritual Award. This award is presented to a person who has inspired others to support Lourdes. Nancy was instrumental in re-establishing the Lourdes' Guild. 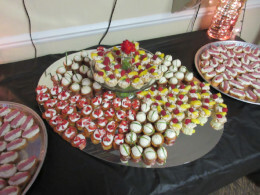 The guild orchestrated community events and fund raisers, including card parties, bake sales, talent and fashion shows. 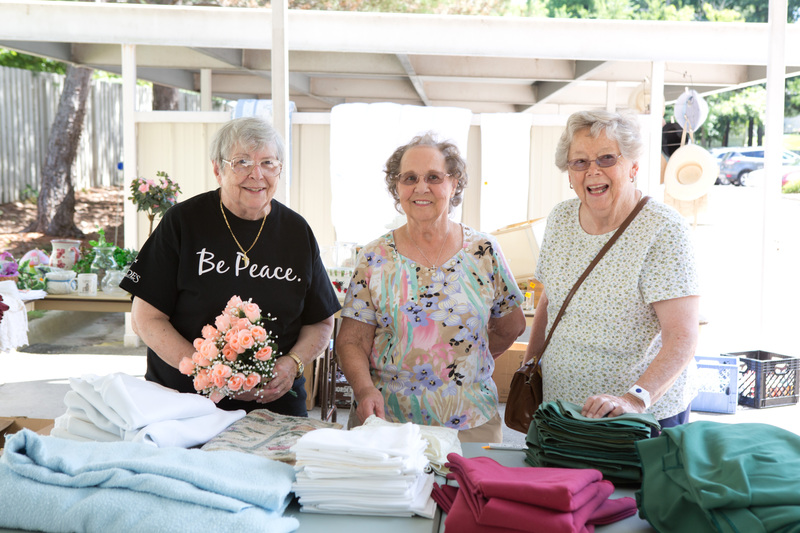 Through their hard work and dedication, the guild provided the residents of Lourdes Nursing Home with a better quality senior living experience. Please join us for a lovely service and program as we celebrate the Legacy of Lourdes. At Lourdes Senior Community we have a strong commitment to creating a quality senior living experience, providing a “homelike” atmosphere for our residents. Each person who passes through our doors has different needs, preferences and abilities. As such we diligently work to provide individualized care, honoring the uniqueness of each resident in accordance with our mission. We are thankful for all of our employees who truly help make Lourdes “a great place to call home” and in this issue of The Continuum we highlight the beneficial work of our dietary staff. 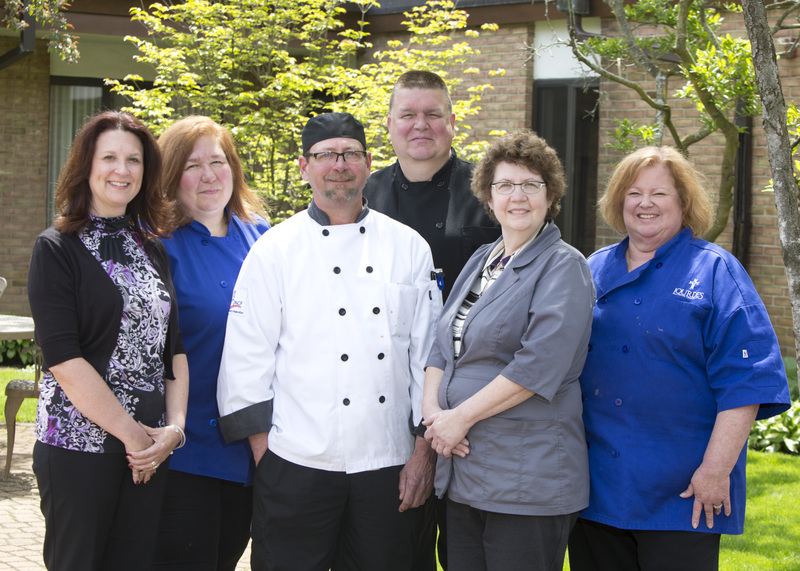 As the relationship between health care and food service continues to change, we are fortunate to have a wonderful team of Kitchen Managers, Chefs, Food Specialists, Dieticians and Dietary Aides who thoughtfully prepare each meal and cater events. Their dedication, skill and compassion ensure a pleasant dining experience for each of our residents. We are also blessed to have a generous amount of volunteers who offer their time and talents. On April 27, 2017 Lourdes Senior Community hosted a celebratory lunch, honoring over 50 volunteers who assist with events, transportation, grounds keeping and many other services. We are thankful for their gifts and hope you are inspired by their generosity. As always, your prayers and support are appreciated. The impact you have on the legacy of Lourdes is immeasurable. May you enjoy these summer months and welcome the seasonal graces of our generous God. Agility Health Joins the Lourdes Family! Lourdes Senior Community is excited to take the next step in providing the best care possible for our residents. With that goal in mind we are now working with Agility Health to provide therapy services throughout Lourdes Senior Community! 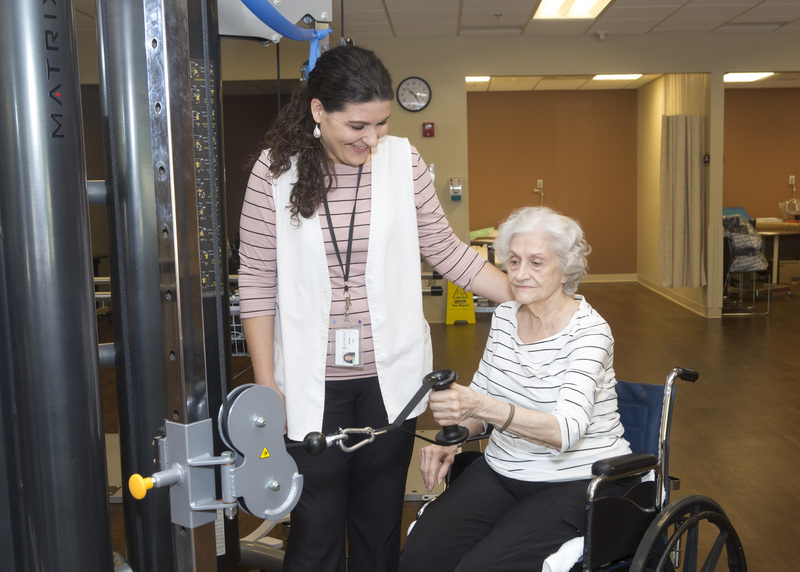 Agility Health comes to Lourdes with a history of delivering high-value rehab, including physical, occupational and speech therapy. We look forward to continuing the mission of the Dominican Sisters of Peace as we strive for the best possible care for all of our residents. Welcome Agility Health to the Lourdes Family! Fox Manor is having a garage sale! Come see all the great treasures for sale and say hello to our one-of-a-kind residents. Items for sale include: furniture, books, dishes, jewelry and much more! The sale will run from 9:00 am - 3:00 pm both days. The staff of Lourdes Senior Community brought the Tigers luck when they attended the Tiger's game Wednesday, June 7, 2017! The Tigers won 4-0 and Lourdes' staff had an amazing time. 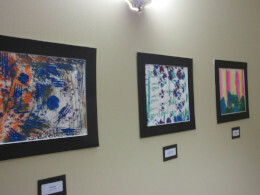 Opening Minds through Art Second Annual Art Gallery! Thursday, March 30, 2017, residents showcased their artwork at the Second Annual Opening Minds through Art Gallery Exhibition. Family, friends and the community were invited to view displayed artwork, meet the artists and volunteers, and share refreshments. 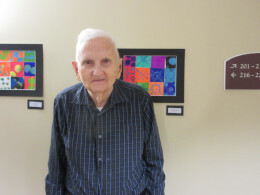 The resident's took delight in posing for pictures with their art and talking to guests. Each piece of work was unique, blending bright colors as well as different mediums. While paint is their most used tool for self-expression, residents are also given the choice of experimenting with glitter, yarn, foil, tissue paper and fabric. The resulting artwork are masterpieces. OMA will begin again next fall with new projects and more fun. Lourdes Senior Community is hosting a Golf at Lourdes Day open to all residents and family. Join us for a great time of friendship and games. There will be putt-putt, ladder golf, and an array of other activities for all ages. Hot dogs, ice cream, and beverages will be available for purchase, and don’t miss out on the opportunity to participate in our 50/50 raffle and silent auction. 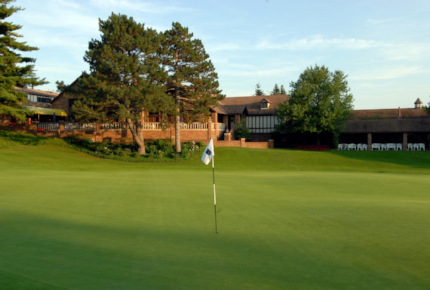 Plans are under way for the 16th Annual Golf for Lourdes on Tuesday, June 13th, at the prestigious Indianwood Golf & Country Club, 1081 Indianwood Road in Lake Orion. It will be the third year the event is to be played on the beautiful and challenging “New” course at a club that includes exquisite amenities. Check-in and continental breakfast begin at 8:30 a.m., and the shotgun start is at 9:30. Lunch is served during the event, and a dinner and live auction follow golf. The registration fee is $225 per golfer. More than $60,000 was raised last year through golf and the silent auction, emceed again by dedicated Lourdes supporter, Steve Garagiola, news anchor at WDIV-TV. Come celebrate our Sweet 16 and support this wonderful event. To register for this event or for more information about sponsorship or donation opportunities, please contact Elisha Christopher in the Development Office at 248-886-5673 or echristopher@lourdes-sc.org. Each of our homes features specialized care for any senior need you can imagine. Please browse our locations below for insight in to each facilities care capabilities, and amenities that they provide. The generosity of our donors impacts the life and legacy of Lourdes in immeasurable ways, ensuring excellence through a variety of programs and services. Thank you for helping us remain a leader in quality senior living. © 2016 Lourdes Senior Community.